Development entrepreneur and innovator who has built her own company, and merged with Abt Associates in 2013. Since Since merging with Abt Associates Dr Thomason has led the growth and diversification of Abt JTA to achieve a tripling of revenue and diversification into governance and women's empowerment. Now CEO of $200m revenue company with 650 staff across Asia and the Pacific. 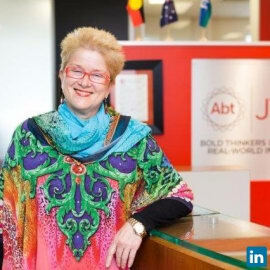 Jane has been a leader of a  wide range of development programs globally, regionally and in Australia, Asia and the Pacific. Team Leader for  Asian Development Bank, WHO, World Bank, USAID and AusAID. Lead Public Private Partnerships with  the extractive industries. Key senior  appointments including  Queensland Director of Women’s Health, CEO of the Queensland Royal Children’s Hospital, Commissioner on the Commission of Inquiry into Child Abuse in Queensland, Chairman of the Wesley Hospital Board, Member of the Uniting Health Care Board, the International Operations Committee of the Red Cross, the Consultative Council of the Australian Centre for International Tropical Health and Nutrition and the Aid Advisory Council to the Australian  Minister of Foreign Affairs and Trade (Alexander Downer), Member of the  Burnett Institute Board,  Adjunct Associate Professor at the University of Queensland, Adviser to the WHO Assistant Director-General for Family, Women's and Children's Health, Geneva, Switzerland and on a Global Working group on Civil Registration and Vital Statistics. She has published on Papua New Guinea, health systems, decentralisation, public private partnerships and civil registration and vital statistics. Jane is an active role model for future women leaders  and an active  supporter of innovation and new technologies, especially blockchain,  and their application to the problems of the poor.